Graeme Dennes has updated his Tanh-Sinh Quadrature spreadsheet to include Double Exponential Quadrature. His brief notes are given below, and more details and links to background information are included in the download file. Double Exponential Quadrature UDFs added to Tanh-Sinh Quadrature workbook. Two Double Exponential (DE) quadrature UDFs to calculate the numerical integral of a function over the semi-infinite interval (a,inf) have been added to the Tanh-Sinh Quadrature workbook. The UDF named DE_QUAD will integrate non-oscillatory integrals, ie, those without periodic trigonometric functions like sine, cosine, etc, while the UDF named DE_OSC_QUAD will integrate oscillatory integrals. Like the Tanh-Sinh program, the two DE programs provide excellent performance, primarily because the three programs are based on the Double Exponential quadrature technique (developed by Takahasi and Mori in 1974). The revised zip file may be downloaded here: Tanh-Sinh and DE Quadrature.zip. Note: New version (1.51) with minor corrections uploaded 9 Mar 2011. 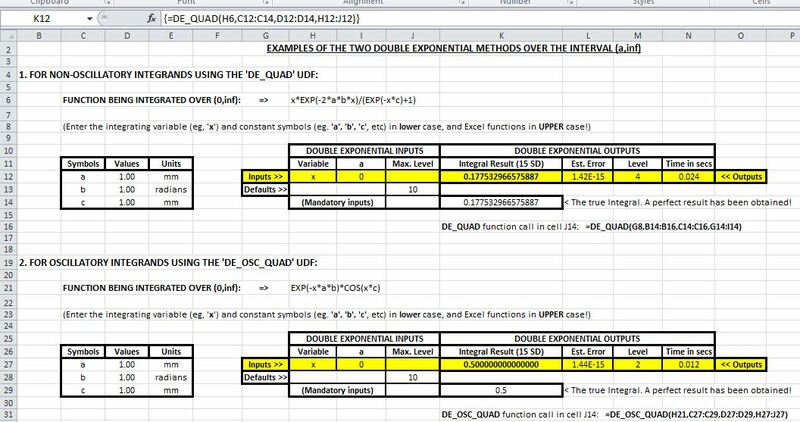 This entry was posted in Excel, Maths, Newton, Numerical integration, UDFs, VBA and tagged Double exponential quadrature, Excel, numerical integration, Tanh-Sinh method, UDF, VBA. Bookmark the permalink.